What Does Sustainable, Fair Trade Coffee Mean? There is a textbook definition of the word “journey”: an act or instance of traveling from one place to another. Within the framework of our collective consciousness as people, however, the true meaning of a journey lies within ourselves. The word can imply the growth of very specific ideas and understanding within a set time frame; or perhaps a long and hard-earned internal challenge, met through overcoming emotional obstacles and hurdles. There is always a change on a journey. More than the simple act of moving from one place to another, the journey morphs the journeyer throughout that move into a different place—either mental or physical, and occasionally both. 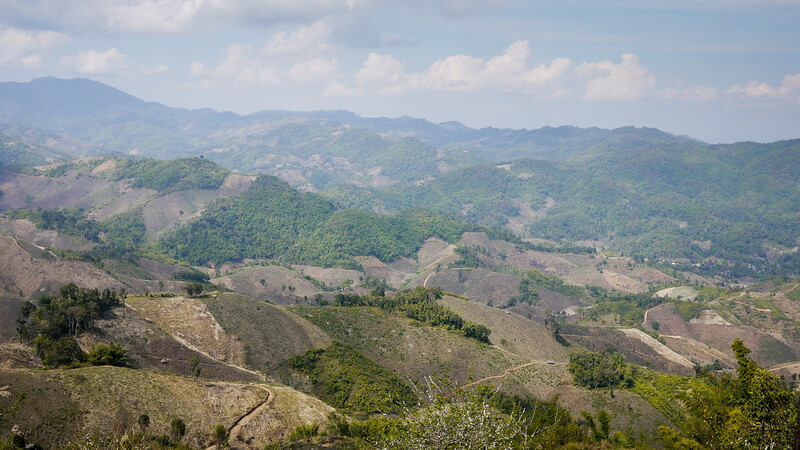 Panoramic views from the back of the bumpy pickup truck as we headed to Akha Ama coffee village near Chiang Rai, Thailand. Two years ago I met Lee, a coffee shop owner living in Chiang Mai, Thailand but originally from a small hill-tribe village about four hours away. Lee is on a long journey, but it’s not a voyage of distance. He runs Akha Ama Coffee, a fair trade coffee shop. It wasn’t until I met Lee, and went on a Coffee Journey with him that I came to a deeper understanding of what it means when something is sustainably produced with a mind toward fair prices paid to the people producing the coffee, ie., fair trade. Through my friendship with Lee over the past two years, I began to look more closely at how Westerners perceive the impact of our actions when we consume something innocuously labeled as sustainable and fair trade. What does that mean? As a writer who has ever emphasized the need for each traveler to begin understanding how intrinsically linked we are on this planet, I found myself humbled by where I myself was apparently situated on that continuum. From organically grown coffee plants to a hand-brewed cup of coffee, Akha Ama Coffee takes the beans on a sustainable journey the entire way. That’s the Akha Ama logo replicated in latte art! In 2011, I first came to Chiang Mai, Thailand and took up residence as a nomadic expat—I lived there, but for just five months. I landed in Chiang Mai knowing other travelers and expats living in the city, but I was acquainted with few locals. After finding a place to live and dispensing with other practical matters, my first order of business in any new place is tracking down a decent coffee shop—not only because locating caffeine and fast wi-fi are integral parts of me feathering my nest, but because I’ve found with experience that this is the best way to meet new people. This is how I initially found myself at Lee’s Akha Ama coffee shop. His name is known in the local expat community, and with good reason: he is young, charming, and the kind of character who seems to attract a bevy of fast friends. To no surprise, I bonded quickly with Lee. Getting to know him better, and experiencing that gradual break with sonder that tends to happen in new acquaintanceship, however, was how I discovered that Lee’s story—the unspoken history underpinning his actions—is what really makes his personal journey stand out. 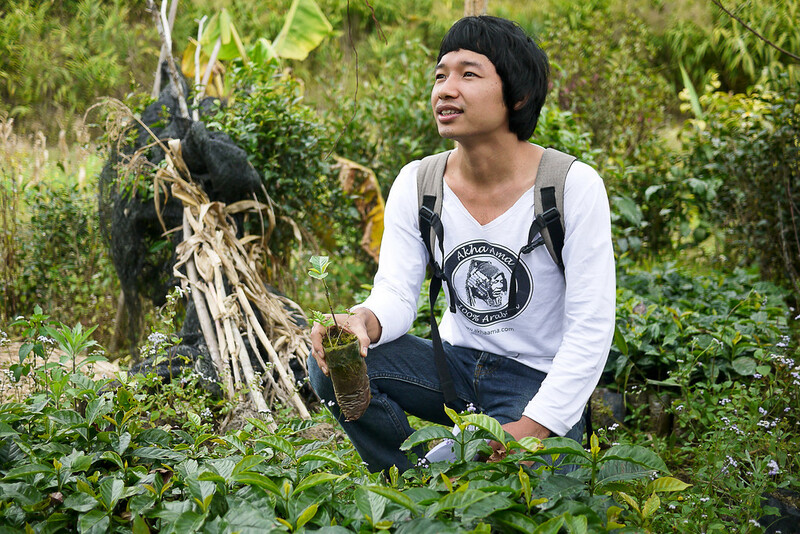 Lee is the face of Akha Ama Coffee, and organizes a biannual trip that takes a dozen people to his family’s remote village, where the coffee Lee sells and markets at his shop is grown. 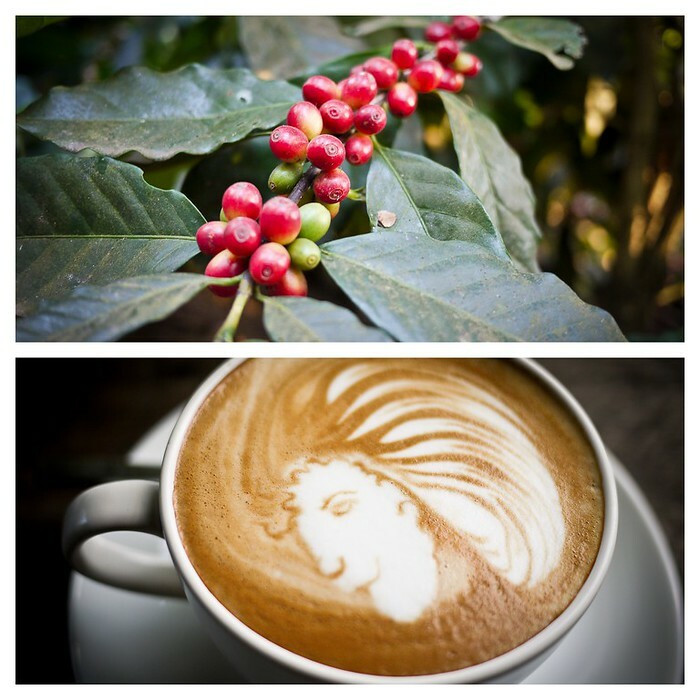 Lee calls these trips a “coffee journey.” That’s not hubris, either—the technical basics of making coffee are rather simple and can be covered with a quick overview (such as the two-hour trip through the Finca Filidefia plantation in Guatemala I took a few years ago). Lee’s trip, on the other hand, is a three-day journey toward understanding just what goes into a cup of sustainably grown coffee. It’s about the journey his village is taking toward operating as a sustainable, fair trade farming cooperative, and the human story and struggles behind each cup of coffee. Lee explained how the high-quality Arabica coffee beans are grown, and how crop rotation promotes higher crop yields without the use of pesticides. 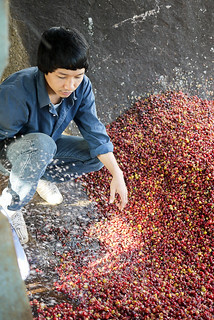 I took my first Coffee Journey with Lee during those initial five months I lived in Chiang Mai. Having cherished the experience and come to call Lee a friend, I returned with my niece Ana in tow to again make the journey over New Year’s weekend as we welcomed 2012. Ana knew Lee only as the nice guy from the coffee shop at that point. I shared with her his powerful story, and by the time we departed, she knew that Lee not only sold coffee, but was the front-end funnel for a community coffee production collective. The Akha Ama Coffee Collective represents 14 families from the Maejantai village area that have joined together under one brand to increase their ability to control, market, and command fair prices for the coffee they grow. They formed the collective so each family could bring in more money and thus assure themselves fair wages with which to obtain education for their children and modern conveniences. 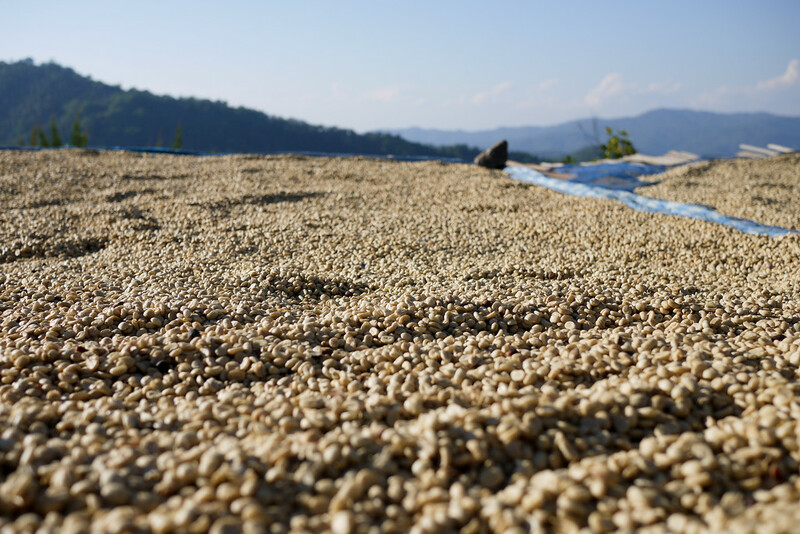 Lee’s mother spread the recently husked, wet coffee beans in the sunlight so the beans were thoroughly dry before villagers bagged them and trucked the beans to Chiang Mai for roasting. 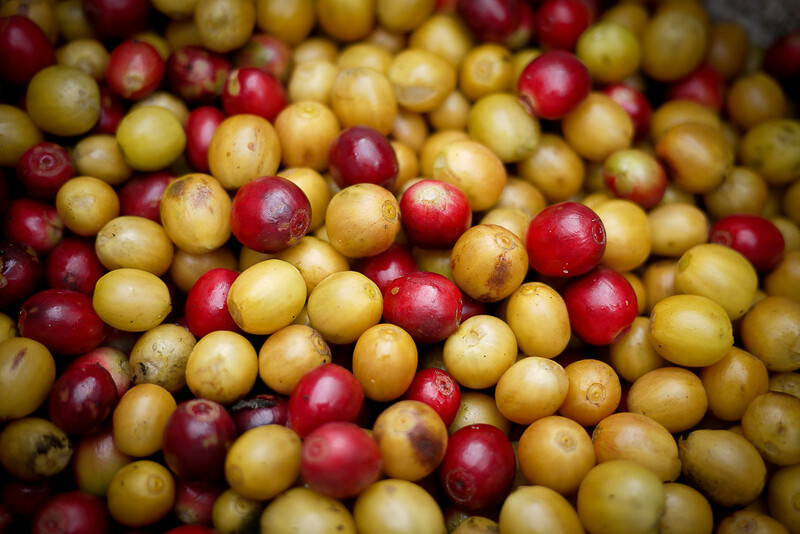 The coffee journey to Maejantai village is not a cushy, high-end tour, nor is it intended to be. Participants sleep in homes graciously offered by one of the 14 families, and they eat family-style meals replete with hand-picked greens grown on the surrounding farms. For Ana, I knew this trip would be unlike anything else she’s experienced. Going into it, I hoped her existing friendship with Lee would give her a unique window through which she could view and understand the paths and choices people make to change their lives when they are given far different circumstances than the ones Ana experienced in her suburban American life. 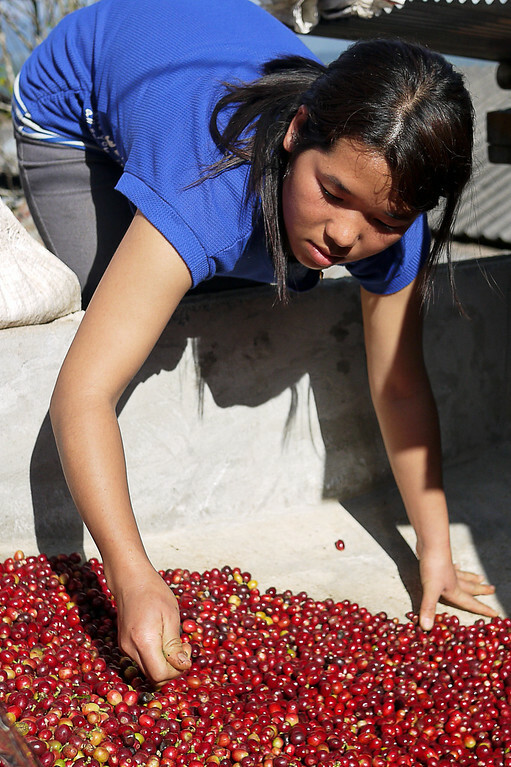 Our journey began in Chiang Mai, early on a Friday morning during coffee harvesting season. Participants arrived at the coffee shop with enough gear for a weekend, and piled into the back of the yellow songthaews (covered pickup trucks). With our thighs squished tight and shoulders wedged against one another, sheer proximity made a surprisingly effective safety harness against the bumpy ride outside of town and eventually into the mountains surrounding Chiang Rai. Hours later, with just a quarter-mile of jolting progress up the mountain remaining, children from Lee’s village began chasing after our truck. Seeing Ana’s young(er) face among the coffee journey participants excited and fascinated the kids, and their huge smiles and waves were our first welcome to Maejantai. Shaking the pervasive red dust from my hair, face, teeth and eyes, I trooped upstairs with Ana to introduce Lee’s mother, the business’s namesake. (Lee belongs to the Akha people. In the Akha language, “ama” means mother.) Lee’s mother reserved a special hug for me, one of the few participants making a repeat journey. It touched me that she remembered my face from last year. 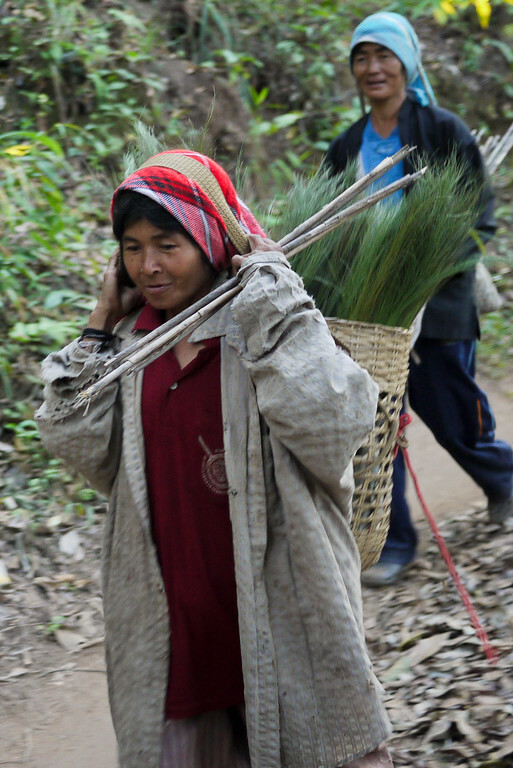 Political issues and cultural differences have resulted in limited financial advancement opportunities for hill-tribe communities over the years, but Akha Ama aims to fill that gap. Lee forged a unique link between the village and mainstream Thai culture. As his mother welcomed us and prepared tea for the group, Lee launched into his back story: the tale of how Akha Ama came into existence. The Akha people, who share a common language, have nonetheless been scattered throughout Thailand, China, Laos, and Burma (Myanmar) over the past several hundred years as the result of civil wars and demarcation disagreements. These hill-tribe groups have largely been separated from rapid Westernization, owing to both the isolation of the regions in which they’ve settled and the fact that they generally don’t speak the main language of the countries in which they live. When Lee grew up, his mother urged him to leave his village and gain a formal education in nearby Chiang Rai. He became the first and, to date, only villager to obtain higher education. Lee studied Thai and learned English from passing tourists. 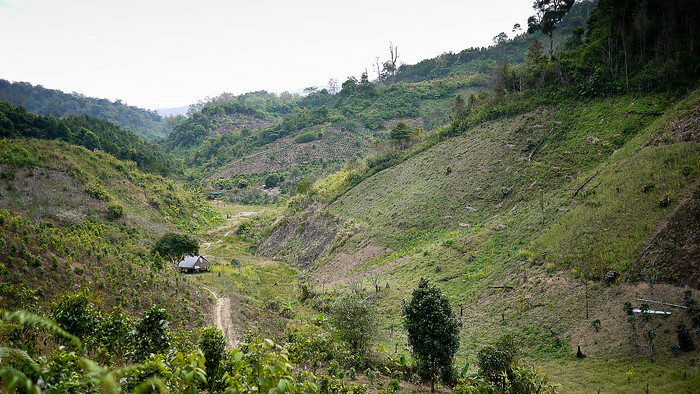 Gradually, as he discovered the value in community-sourced projects, he began plotting a way to help the Akha farmers and villages in his region. Lee’s mother supported his idea and was the catalyst in bringing together the 14 families that today make up the Akha Ama collective. There is always strength in numbers, but the collective succeeds also because the 14 families are working together toward sustainable agriculture that not only produces an organic crop, but avoids the use of expensive, harmful pesticides as well. New methods of crop rotation are the key to sustaining these eco-friendly products in the long-term, and the collective has implemented processes that will take years to fully bear out. This is the foundation on which the families formed Akha Ama, and out of necessity, it is a gross simplification of Lee’s story. Before the farmers in Maejantai village formed the collective, they had only one means of making money—sell their coffee beans at the going rate to whomever was buying. Lee forged a unique link between the village and mainstream Thai culture, however, and at that point Lee and his family saw an opportunity to see the beans completely through the process. Consequently, farmers could see more monetary returns on their time and effort. 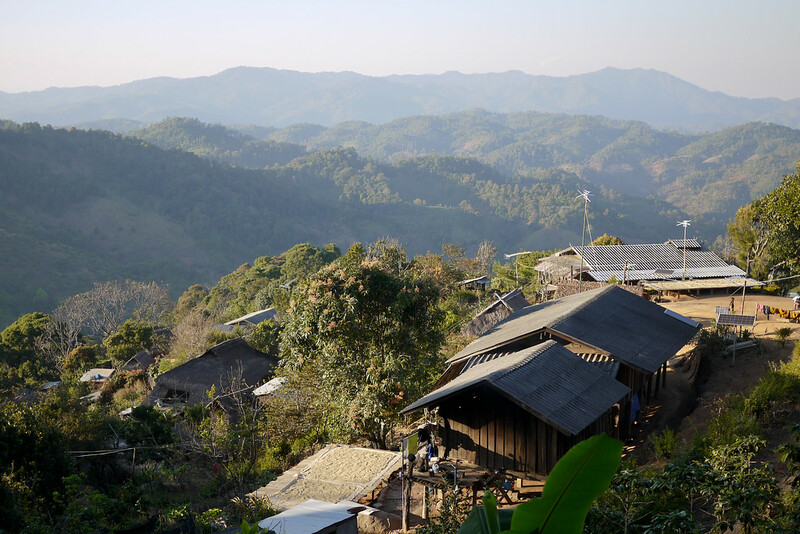 Political issues and cultural differences have resulted in limited financial advancement opportunities for hill-tribe communities over the years, but Akha Ama aims to fill that gap. Lee’s village may be remote, but the influence of Western culture and advancement has taken root even in Maejantai. Villagers must pay for their children to attend a nearby school, and the demand for conveniences like cell phones have necessitated a move toward a more monetary-based system in the villages. 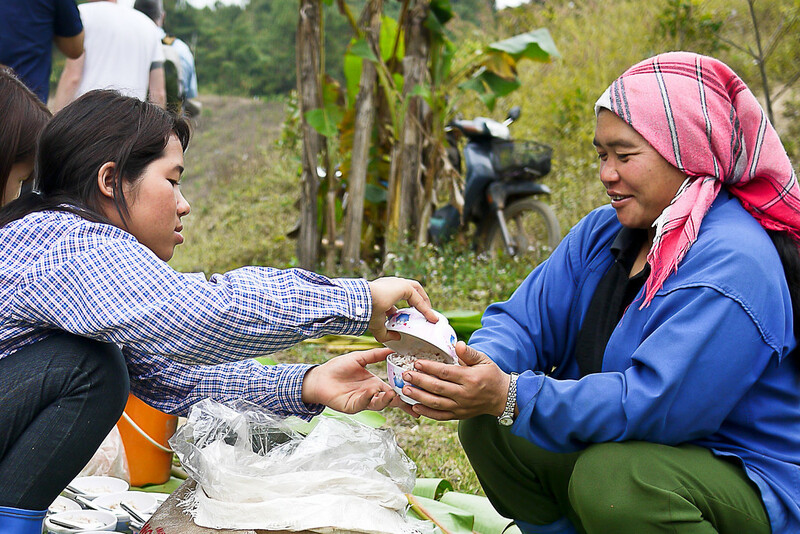 Akha Ama’s goals are both social and economic: to not only grant villagers control over what they produce, but to funnel the money back into the community as well. 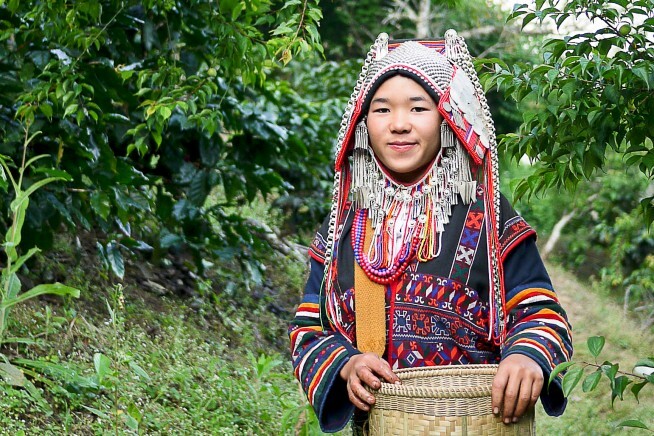 Lee’s sister displayed traditional Akha clothing in the coffee fields nearby. A beautiful sunset over Maejantai village high in the mountains north of Chiang Rai, Thailand. The fields are about a 45 minute walk from the village at a slow pace. On the last turn, the path opens up to this beautiful valley filled with coffee and tea plants. Understanding the political side of Akha Ama is just one part of the Coffee Journey. Hands-on participation in the labor-intensive process of making coffee is just as much a component of the experience, and was no small part of why I wanted to bring Ana along. Throughout the three days, Lee took us through each stage of the coffee process—from picking the beans out in the fields all day, to drying, husking, processing, bagging, storing, and transporting them. 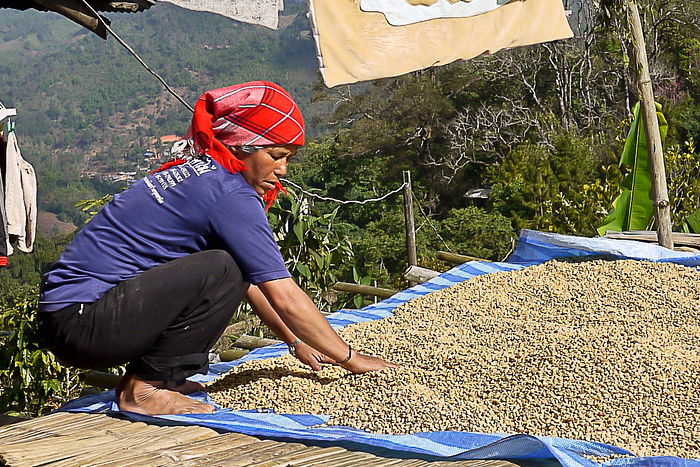 Once Lee is back in Chiang Mai, he roasts the beans, packages them, and sells them through Akha Ama and a handful of other coffee shops in Thailand. On the second day of our Coffee Journey, Ana and I walked for 45 minutes to Lee’s family’s coffee fields, where he explained how the plants are grown and harvested. Then he handed us each baskets and instructed us on how to properly twist and pluck the ripe coffee cherries. 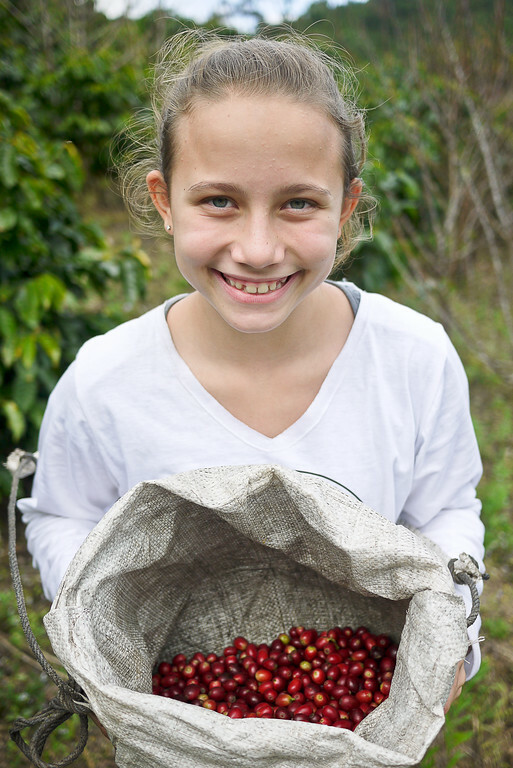 Ana enthusiastically joined in the picking, and by lunchtime our baskets were filled with shining red and yellow cherries. 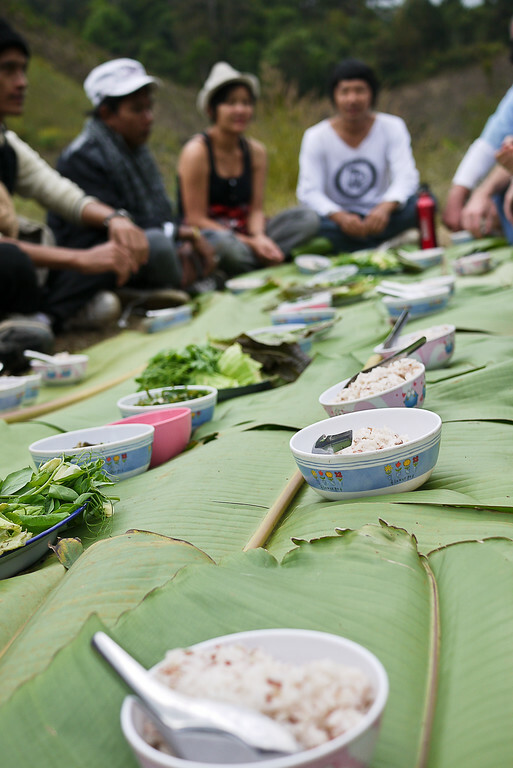 At lunchtime, we ate a plentiful lunch on huge banana leaves. Right after, we headed back into fields for round two. It’s hard to say at which point, for Ana, that the fun of plucking and twisting gave way to an understanding and appreciation of the work that it really is. As our baskets filled, Lee and other villagers eagerly replaced them and encouraged us to continue picking. After several hours, my hands and arms cramped with the small, repetitive tasks. Ana continued to work respectfully, but it was clear that the “game” aspect of this all was gone. Mind you, none of this was exactly miserable—far from it, since the weather was a perfect mix of cool breeze and warm sunshine. The reality of the task, however, of picking all day for your survival and livelihood, had sunk in for our rag-tag group of 20 or so participants. While we worked, Lee’s family gathered vegetables and prepared dinner for our group. Feeding twenty ravenous people is no small task, either! And as it happened, on this second Coffee Journey, at the end of our long day in the fields, Ana and I joined the group around a large bonfire under a sky filled with more stars than Ana had ever seen in her life and welcomed in the New Year with new friends, new realizations, and perspective shifts on what it takes to live and enjoy life. The realities of processing coffee continued unabated the next day as we watched Lee’s sister sort through the coffee berries, discarding the under-ripe berries we unknowingly plucked. A machine then separated the beans from the husks, after which the families took these wet coffee beans to huge tarp-covered pallets so to dry out in the cool mountain air. Dry beans are then bagged and stored until they are ready for the journey to Chiang Mai, where Lee roasts the beans, bags them, and either sells them or grinds them for coffee. 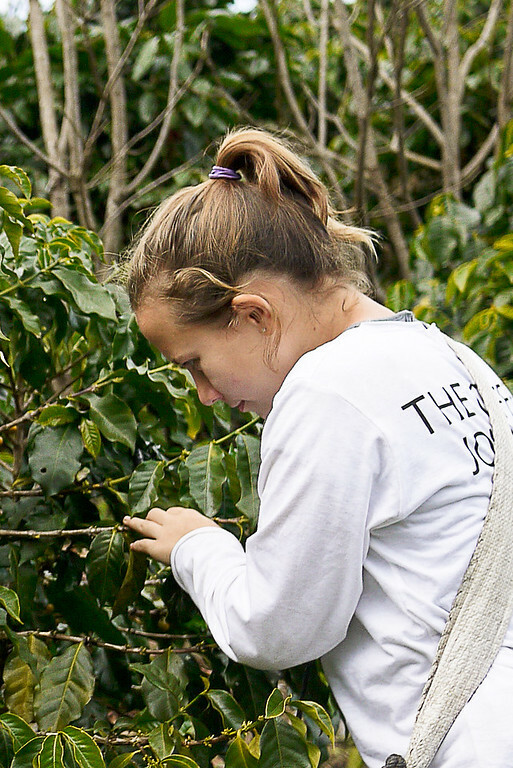 At its most basic, fair trade means that the people at the beginning of the process — the community growing your coffee, chocolate, cotton — have a shot at fair profits and fair opportunities. Without this equality, the harsh reality is that communities in the developing world are forced to sell their goods for whatever someone will pay. Lee’s village is beautiful. The people and smiles were open and welcoming from the moment our feet hit the compact, dusty red earth. Our welcome was genuine and each villager we met was willing to open up to a group of strangers in the hopes that we would take away an understanding of all that lies behind the Akha Ama brand. There are people behind that logo. A community of children, mothers, and fathers exist behind each package of coffee Lee sells in his shop. The money from each sale is a tangible investment in a remote community living on a faraway hill-side. Ana watched the young children in Maejantai play games around her, using their imaginations to fuel epic staged battles between good and evil that echoed the games her little brother regularly plays back home. I didn’t have to point out the similarities. Anyone can see that they exist—our common humanity is as clear as day. Our Coffee Journey lasted three days; Lee’s coffee journey is ongoing. As the face and front-end of Akha Ama, Lee is actively working to promote the brand as a sustainable, fair trade, organic coffee brand. Only through talking with Lee and then visiting his village’s collective did I realize the lengthy and expensive process that goes into legally using many of these buzzwords. When he conceived of Akha Ama, Lee embarked on a process that could secure the future of his village for generations. Beyond farming, there are few viable economic opportunities for such a remote community. In recent years, the lure of modernization has taken much of the youth out of the village and into the big cities. But with money, an operation, and something to back and believe in, Akha Ama is changing opportunities for each family of the Maejantai collective. Over the years, news stories have indicted the idea of fair trade as flawed and unable to substantiate on a large-scale. We hear discouraging stories like the scandal that came out of Victoria’s Secret in late 2011 when one of their suppliers of certified fair trade cotton in Burkina Faso used child labor to pick and plant, contravening established fair trade rules. It’s easy to throw the proverbial baby out with the bathwater and give up on the whole idea, given the negative press. Through meeting Lee, and visiting Akha Ama, however, I was able to put a face and an experience on the entire process. At its most basic, fair trade means that the people at the beginning of the process—the community growing your coffee/chocolate/cotton—have a shot at fair profits and fair opportunities. Without this equality, the harsh reality is that communities in the developing world are forced to sell their goods for whatever someone will pay. Too often, that means selling below costs just for the sake of having some money in pocket. 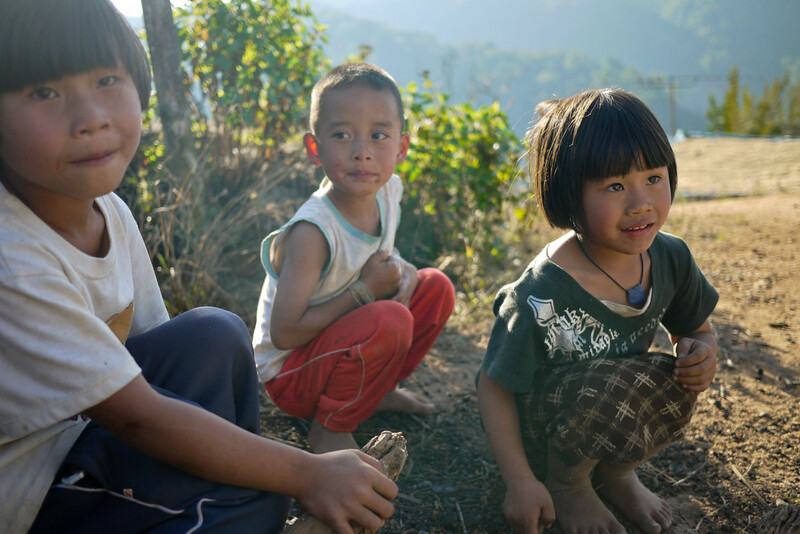 Maejantai village; the children and their families work towards a lasting future for their community. Motorcycles ferry the heavy bags of coffee cherries back to the village. This is not to say that the process is without flaws; far from it, actually. At the end of the line, we consumers remain completely removed from the true back story and from the people and lives involved in the products we buy and use. But Akha Ama’s story, with Lee as the charismatic and affable face of this operation, is but one example of social enterprises and fair businesses operating around the world so communities can better themselves—create a future for their children. It may not be perfect, but it’s a whole lot better than the alternative. Further, Lee’s story opened my eyes to the human effect our purchasing habits have on the entire global community. By lifting the common consciousness, by seeking out the simple ways to support and give back in everyday life, we will be able begin lifting up the global community. It’s usually a small thing to tweak our buying habits. For myself, a habitual purchaser of coffee and chocolate, my new-found awareness has led me to seek the chance to support companies making an extra effort. I will spend more to ensure that the root communities behind our goods are treated with respect. Stemming from my physical journey to understand coffee came a new journey to match my actions to my belief in our shared humanity and the common good. To Lee, thank you. The Akha Ama Coffee shop was my refuge in Chiang Mai, and the community of expats and locals you have assembled in the coffee shop are a testament to the goodness and possibilities that are out there if you look for them. This post blends time and space and represents the sum of the two Coffee Journeys I took with Akha Ama; the photos from each journey are interspersed. For more photos, enjoy the additional photo gallery and Quick Tips information. Where: 9/1 Mata Apartment, Hassadhisawee Rd, Soi 3. The coffee shop is in the Santitham are, just off the Northwest corner of the moat in Chiang Mai, Thailand: directions. When: The Coffee Journeys take place twice annually and sell out months in advance. Lee is open with his story, however, and you can support Akha Ama Coffee by visiting the shop, buying coffee as souvenirs for family, and supporting their efforts to grow the Akha Ama brand. 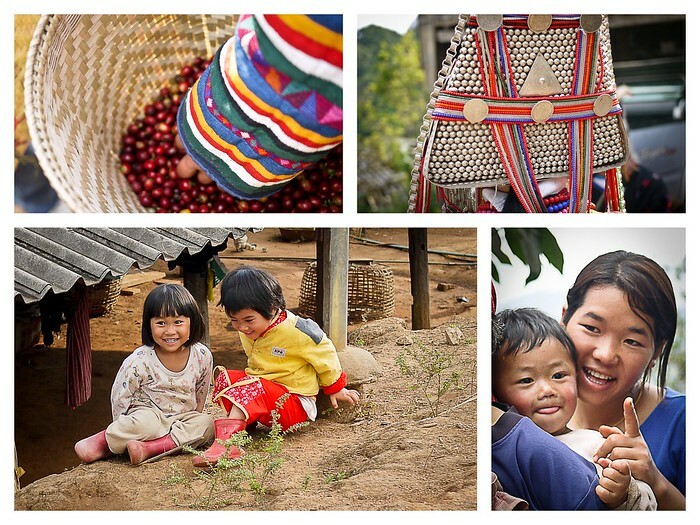 Why: Because Akha Ama is a social enterprise (a for-profit business operating with an underlying social mission) worth supporting–it’s a community grown initiative and empowers the Akha villagers to support themselves and their families for years to come. Wow, thank you for explaining this difficult concept so well! It was great to learn about this and I’ll definitely be making an effort in the future to drink more fair-trade coffee. Thank you Aimee, so glad to hear that it resonated! I find it so fascinating to learn the behind-the-scenes processes that get the foods and products we love to our dinner tables. Thanks for reading! Thanks for sharing this! At my college, we had a fair trade club that sold different foods such as, chocolate. I would always hear the word fair trade, but it felt very disconnected. I didn’t have a full understanding. It was nice to really put a face/name/community to the word fair trade. You did a great job displaying that! When I return to Chiang Mai, I would love to visit Lee’s spot and support his community he created. Amazing article and very informative! It is eye opening to see what the term fair trade means to the collective communities that participate in them. I won’t take it for granted the next time when choosing 2 similar products, where one is labeled fair trade and the other is not. It’s posts like these that re-affirm my awareness of the need of pricing foodstuffs fairly. This, and the story of a wine-producing friend of mine, who’s currently got a bump harvest in Italy, thanks to a wet spring and hot summer. Approximately half a ton, which he’ll probably sell for 400 euro, or 0.8 euro/kg. It’s peanuts, compared to the work he’s had to do, the constant care, the constant worry of weather – hailstorms, freeze – and animals (boars or deers). And there I am, making faces because the grapes I buy at the supermarket are 4 euro/kg. The same applies to coffee: have I ever thought at the livelihood of those who are producing these, for me, basic staples? No, never. Thank you so much for reading, I am so glad to hear that you found important takeaways from the story—a new perspective on how our purchases can have a very real effect on people and places all over the world. Wine-making is also one of those insanely labor-intensive processes, with a lot of weather risks, that it’s crazy when we race to the bottom on prices for goods like these. I also appreciate when food is grown with thought and care, being mindful about the values the nature gives to us. Your story was truly inspiring! Thank you for sharing these thoughts with us! So glad that the piece resonated with you Vera, many thanks! Thanks for sharing this. Honestly haven’t read it all – but will. Loved how you write and the pics you shared. Thanks! So glad it resonated! There’s a lot of amazing photos, some of them look really professional. did you take all of them on your own? some look like studio shots, for real.. I always wondered what sustainability meant and i am always reluctant to buy fair trade materials because a) there are really expensive and b) because they are usually available in malls along with other consumer goods that I always suspect that it might just be another ordinary item with ‘fair trade’ printed on top of it. So in that regard, you are lucky that you got to meet the face of such an enterprise. It is essential in a way to know the people that you are affecting. Like you, I see a lot to be skeptical of in this type of marketing, so it was refreshing to see what it can look like on the small scale especially, before the multi-nationals get involved and dilute the supply chain to the point that you have no idea of your impact. So glad the piece resonated, thanks for reading Mayur! Few people understand what really means “sustainably produced”. Good luck Shannon O’Donnell! I love your post! This was so interesting and fascinating to see the backstory of the journey, story of coffee along with Fair Trade as well as the people behind it from different cultures, backgrounds. Very insightful post! Everything you explained here highlights the same questions I have for organic and fair-trade sold in our grocery stores, shops and markets. I feel the same way about recycling… I mean, I feel a sense of solace whenever I throw my compostable cups into the “right” bin, but I don’t often question what the process is of disposing the said cup. You gave a very insightful experience of the tour and it reminded me that being contentious of a process or labeled thing isn’t the entire story. You did an amazing job with the information and photos and sharing useful information. Thank you. I’d love to share a link to your post on Facebook; is that ok with you? Absolutely, thank you Cindy, I would be honored! I just shared it on Facebook. I finally was able to read more fully (my quick skim earlier impressed me but I didn’t have time to read it all then). It’s a well-written and educational and interesting piece. Thank you again for sharing it. As a coffee lover I absolutrly adore this! Thank you for sharing this!???? Adoro el café y sus efectos, esta historia de catorce familias produciendo un grano de calidad y limpio, que les sirva de sustento. De alguna manera justifica más mi gusto por mi dosis en las mañanas. También adoro mi cafecito cada día y lo sabe mejor cuando yo se que las familias también pueden tener una buena vida. Gracias por leer mi historia! Fair Trade Coffee is a scam. Period. The crop is sustainable because new plants are always added. But the charade that Fair Trade helps farmers is a joke and people needs to stop propagating the lie. It’s a pyramid scheme where local exporters pay small farmers a pittance, like 15 cents a pound for coffee beans, and then sell the product to a bigger company which will labeled it “Fair Trade”. Add to that, the fact that companies are telling farmers when to pick the beans and consumers are left with a product that rivals saw dust. Did you even read the piece? 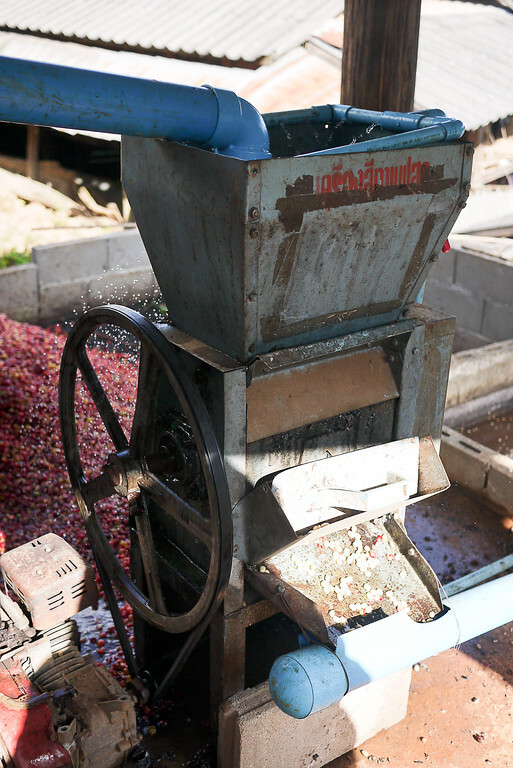 This is a small farm that controls not only their production of it, but the roasting and selling process, too. And I can tell you that it has truly transformed this village, and their ability to command a fair price for their crops. The global industry might have issues, but on the small scale, your purchasing choices can actually move the needle on keeping more money in the hands of the farmers growing the food. I have met these farmers, and seen their beans roasted and sold to local coffee shops — it’s made an undeniable difference in their lives. And this community put everything they had into making this a reality exactly so that they could avoid the situation you described. I can’t help but believe you trolled this comment and didn’t read the piece. I really enjoyed this!!! I learned some stuff I didn’t even know I needed to learn! Thanks! So glad the piece resonated! Amazing. I didn’t even know this kind of coffee journey existed. Looking at the Akha Ama website, Lee really knows what he’s doing. It’s an impressive project! He must be a real blessing to those 14 families. Maybe this is a real development model for rural communities? Go beyond the ‘local produce’ store and turn it into some sort of microbrand that offers not only their products, but a glimpse (or a trip) into their lives. It definitely seems to make for a much more exciting experience than whatever top 3 tourist attractions Tripadvisor is currently flaunting. I’ve seen other ‘coffee journeys’ that I’m sure would make for a nice hike, but this one really seemed unique. Unfortunately I’m a bit late for the November tour this year, but I’ve added it to my to-do (to-travel?) list :). It’s interesting to hear about how similar projects are fairing in other nations. Outstanding, long-term thinking and loyal leadership really makes a project like this stand out. While that kind of personality is rare and not really something you can ‘replicate’, maybe future development efforts can focus on identifying potential leaders in a community who have a good shot at putting something like this in place. I’ve seen similar approaches work with projects elsewhere, but I’m not aware of any major development agencies who have this as a primary goal. Wow. What a beautifully told story on an important project. It brought tears to my eyes. Thank you for sharing Lee’s work in an artfully told manner (with compelling photos). I would love love love to go on a Coffee Journey and have decided, and am reminded by this post, that I am going to volunteer or work for some kind of social enterprise/benefit project while on my extended south east asia trip. Karla – thanks also for sharing on KNCC and KSDC – I will look into those orbs as well. So glad this piece resonated with you, I really appreciate the kind words. I find Lee’s story very inspiring and was happy to share it and his work with a wider audience. Karla’s information on the Karen projects are some of the only other ones I know of in the area. Chiang Mai region is a huge area for development projects, so when you visit you will surely be able to ask around and find some others that may resonate with you. Safe travels and happy planning! I just discovered your wonderful website and am so thrilled to already find a great article on Lee and Akha Ama! I did the Coffee Journey last fall and have been totally blown away by Lee and his dedication to coffee and to his village. So glad you found him! If you ever make it to NW Thailand (Mae Hong Son), check out Karenni Community College (KnCC) and KSDC (Karenni Social Development Center). I volunteered for KnCC for 6 months this year, and these two CBOs are doing fantastic work along the Thai-Burma border, with Karenni youth from the Nai Soi refugee camp. So wonderful that you did the Coffee Journey as well. And thank you for the recommendations, I added them to GV ( http://grassrootsvolunteering.org/volunteer_opportunities/karenni-social-development-center, let me know if anything doesn’t look right and I will change it — it looks like such a wonderful organization doing work on the border and I would love to work with them one day if I make it back to Northern Thailand. Safe travels and thanks you! this is such a beautiful series of events, Shannon. I’ll be including it on the coffee round up coming next year ;) Happy holidays! Shannon, what a great story! 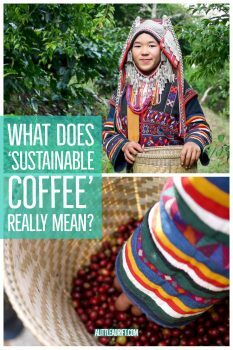 I love the pictures, but I really love that you clarified the nuances of the whole fair trade part of the coffee business. It’s great what Lee has done to help consumers understand what is behind that cup of java that we’re drinking. I’m curious about the part where you mentioned Lee decided not to pursue official certification anymore due to its expensive. Is it expensive strictly on a monetary basis or is considerable time and energy expended by the grower as well? Just wanted to know if its primarily a financial hardship or if there are other factors in his decision(e.g. red tape). Also, he doesn’t publish his coffee journeys on his website. How much did your coffee journey cost(if you’re able to share). Thanks! As for the coffee journey, they sell out so quickly and already have only a handful of spots on each journey, so he doesn’t advertise (same deal here, more demand than room on the tours even without advertising). Wow. Such an inspiring stories. Great experience. A wonderful stories like this will encourage you to do things that really give a good memories and learn more other traditions and cultures. This wouldn’t have come to mind as something to potentially do in Thailand but what a cool idea. A three day trip seems like a much better experience than just a quick few hours for this type of thing. This is such a beautiful reflection of your experience Shannon! I’m fascinated by what is happening in the first world – the organic boom, the buzz words, and while I wholeheartedly believe in sustainable agriculture as a whole, we are still so far removed from these farms and people that we can’t fathom the hard work, lifestyle or innovation and community efforts behind our fair trade chocolate bar or ecological rice. There is no better gift than understanding, seeing it from your own perspective or in this case, your photos and storytelling. Amazing! Thank you for the kind words Lauren, it sounds trite to say, but traveling to places like the Akha community opened my mind to an idea of self and hardwork that I know have never quite existed in my own life. Their position in Thai society, the politics of the region, of growing and selling food, let alone all of the buzz words they then have to navigate to sell and market their coffee was incredible when I witnessed the interplay first hand. Great piece, Shannon. I recently spoke to the founder of a fair trade chocolate company in Madagascar and he talked about how fair trade is such a washed word. The key is not just that local communities survive but that they thrive, learn and grow as well. This reminds me of that. One of my favorite places! The village visit was one of my favorite Thailand experiences – anything with Lee is always fun! Your photos of the Akha traditional wear are wonderful. He’s started such an impressive business. I love that looking at these pictures feels like looking at old friends. Great pictures of Ana with the bag on her head! Now that I’ve been back in the states for a bit, these are the stories that make me miss travel, and of course it doesn’t hurt that your photos are amazin! Beautifully written and a lot of truths restated, we need that every once in a while. I’m glad you got to see so much of what goes on behind the scenes. Thank you Kelly, it was a beautiful experience to stay in that village for a weekend and really brought into deeper focus why we do and should care. I appreciate you taking the time to comment and share, many thanks and safe travels! As a consumer of fair-trade, organic coffee and a champion of social enterprises I particularly appreciated your post. I often think about the families involved in farming coffee beans. Now I have a richer and deeper understanding of the faces behind the morning beverage I currently have in my hand. Excellent post Shannon. I have to admit to a certain cynicism toward ‘fair trade’ and ‘organic’ here in N.America – I can see how, in small communities such as Chiang Rai, these sort of cooperatives can translate to a better business and community but I wonder about the scalability of these efforts when I see ‘fair trade’ labels on big name products here. You have given me cause for thought and reflection on the issue. I will definitely be seeking out Lees coffee shop when I am in Chiang Mai next. Excellent story! Thanks for sharing. Be well. Great article Shannon. Loved the read! It is often true that we view the words Fairtrade and Organic and feel better about ourselves but we never look deeper into if that label actually represents what it is supposed to. Great article – I would love to take this type of tour – rugid and informational.